« Korea Mania : A traveller's tale » at the Cité de la céramique, Sèvres. « Korea Mania : A traveller’s tale » at the Cité de la céramique, Sèvres. this “Traveller’s Tale” invites you on a double journey, that of Victor Collin de Plancy (1853-1922). He explored the space on the Korean peninsula, in the heart of the Far East, in the hopes of discovery an ancient, sophisticated culture, but he also takes us through time, towards this “royal hermit”, which was opened to the world at the end of the 19th century. The first French consul general of Korea, Victor Collin de Plancy collected numerous art objects over thirty years, which he brought back to France. 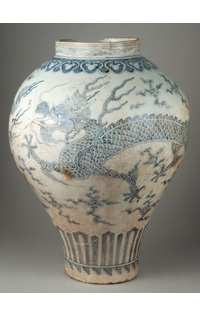 Between 1888 and 1891, he gathered together some 260 pieces of Korean ceramics for the National Museum of Ceramics and the Guimet museum. Today, some of the most beautiful of these objects are on display – a world-first for many of them – as well as numerous photographs, pictures and pieces of furniture. From 21st January to 20th July 2015. "Love is Enough" at the Modern Art Museum, Oxford. « Degas, classics and experimentation » at the Staatliche Kunsthalle, Karlsruhe. « Represent: 200 Years of African American Art » at the Philadelphia Museum of Art, Philadelphia.